The Industrial Revolution was a period of time where the production of products moved from manual labor to labor by machines. As a result, products could be produced faster and with less people. It began in England during the early 1700's. 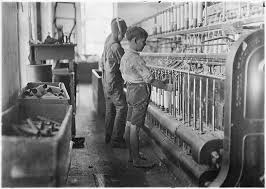 During the Industrial Revolution, children had to work 12 to 18 hours a day, and 6 days a week. Some only got 1 dollar a week! Most factories were dirty, dangerous, and dark. The children, as a result of the nastiness, often contracted diseases and illnesses. Work in mines was very dangerous. A lack of fresh air and the presence of fumes from explosives resulted in lung diseases. The coal dust in the air also caused black lung disease. 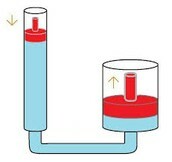 Hydraulics were invented during the Industrial Revolution in 1795. The concept was originally invented by Blaise Pascal in the 1600's. 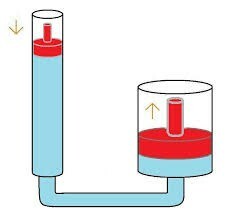 It states that if you have a small cylinder with it's end's area being 1 square inch and a large cylinder with it's end's area being 3 inches, then you would get 9 times the force.